The west coast of Norway is just packed with spectacular scenery. 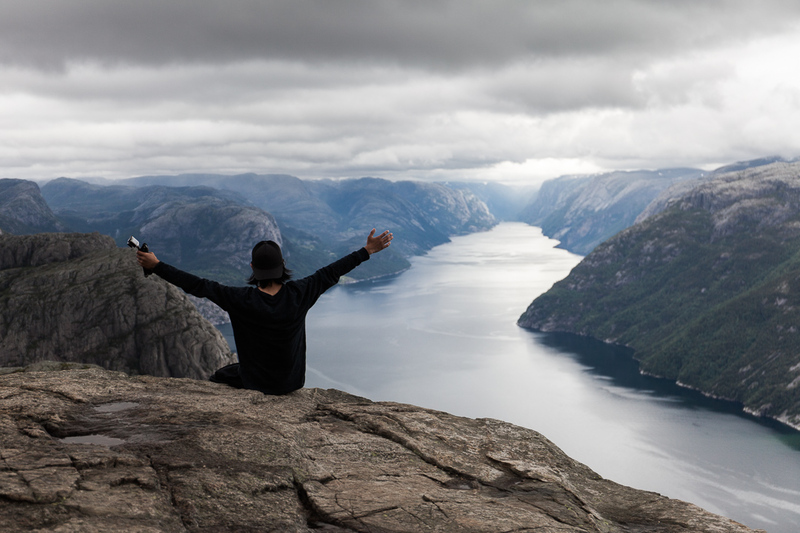 One such place that is surprisingly accessible is Preikestolen, the Pulpit Rock. Although close to the city of Stavanger and with lots of parking area it’s still quite a hike to get to the rock itself. Some 600 meters of ascension over varied terrain can make the most fit person catch their breath once in a while. The hike isn’t that long but the height combined with the terrain usually makes it a 4 hour project with a little rest at the top. We went there during our Norwegian road trip in 2015 and got typical west coast weather, a little sunshine, dramatic skies and someone flipping the on/off button for the rain. This didn’t deter any visitors though, and I’m still astounded by the number of people we saw in sweat pants, sandals and cotton sweaters. The weather changes quickly and being wet in 10-15 °C (50-60°F) is just not fun. Anyway, you need to start really early for having a chance to be by yourself or photograph the rock cleanly (some people do sunrise hikes, starting in the middle of the night to see the sun rise over the rock). I got a little bit lucky and could take some views without people in the frame. One of the main attractions of the Pulpit rock is that it sticks out and has a clean drop of 600 meters to the waters of Lysefjorden. Naturally lots of people peek over the edge trying to get their own senses comprehend what they are taking in – and feel safe. While walking around and trying to get some clean shots I saw this guy walking up quite calm and collected sitting down on the edge. For once I didn’t really object having someone walk into my frame, really liking how he celebrates his mastering over his own fear and the accomplishment of not only getting to Preikestolen but also conquering it. I also didn’t mind having the weather guy playing along and helping out with some beautiful skies. I’ve been trying to find a use for it, while it’s a nice photo for Preikestolen I think it conveys more than that. When I was finishing up The Flip I realized that it conveys a lot of what I’m trying to say – having the end goal in mind and then reaping the benefits once you’ve climbed the hill. In this case both figurately but also conceptually by feeling the rush once you’ve reached the goals you almost didn’t have the guts to spell out. So here it is, The man sitting on the edge.